Pembe Sends a Big “THANK YOU” for His New Prosthetic Foot! Pembe is one of Daylight’s shining stars! He is an inspiration to all the children and staff because he has overcome every obstacle life has thrown at him. Four years ago he came to Daylight only speaking his tribal language, Pokot. But right away he set his mind to learning Swahili AND became a top student in the process! 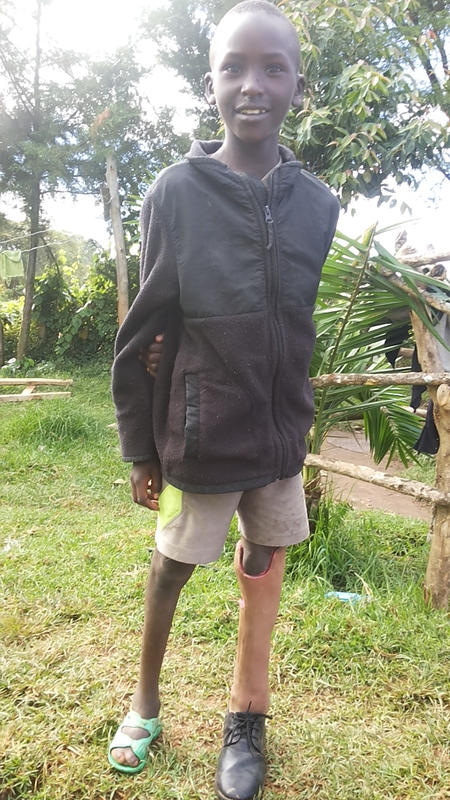 His parents and siblings still live in the village, but he was unable to live out there due to an accident as an infant that took his left foot. Unable to herd cows like his brothers, he was sent to live in the dormitories with the hope he would learn job skills. Pembe has never allowed his disability to hold him back. He plays futbol (soccer) along with the other children. He walks shoulder to shoulder with his classmates. But this fall Pembe began to mention that his ankle was hurting. That he was having leg pain. So Daylight rallied the funds and Pembe was fitted for a prosthetic foot. He is excited and wants to say THANK YOU, ASANTI SANA! Not just for his new foot, but for making his education possible. His parents and family are so proud of him, and they want to express their gratitude as well. Help us Continue to Make Children’s Dreams come true. Make a Pledge for the 2016 School year!